We devote a separate section to an in-depth discussion on the population of Jerusalem. At the outset, it should be noted that in the past seven decades, Jerusalem’s borders and the placement of physical barriers within the city have changed a number of times. According to the UNSCOP Partition Plan (UN Resolution 181, November 29, 1947), Jerusalem was to be a neutral status territory (corpus separatum) under UN supervision. After the War of Independence, the city was divided: its western sector under Israeli control, its eastern part controlled by Jordan. Following the Six-Day War, the two parts were unified, and a number of villages not previously part of Jordanian East Jerusalem were added. However, when the separation barrier was built in the previous decade, a number of Arab villages were left to its east. On the eve of the state’s founding, in 1946, Jerusalem was home to 164,000 residents (Figure 7.1). Following the city’s division in 1948, roughly half remained on the western side (84,000). The Israeli census of 1961 recorded a doubling of residents to 167,000. Following the 1967 reunification of Jerusalem, the number of citizens stood at slightly more than a quarter million. 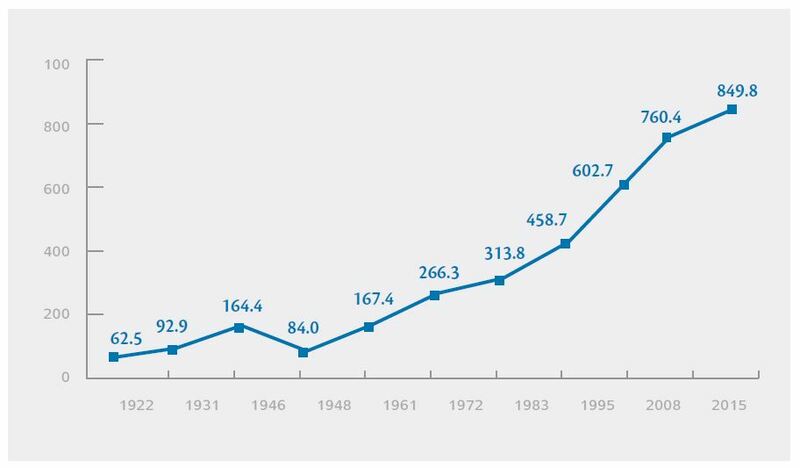 It continued to grow as a result of internal demographic trends and the settlement of new immigrants: it reached 428,000 in 1983, and 750,000 in 2008. Jerusalem’s population today is 850,000 – Israel’s largest city. Until 1946: in the British Mandate borders; since the establishment of the state and until the Six-Day’s War: 1948 borders; following the Six Day War: the borders of a united Jerusalem. Source: The Jerusalem Center for Israel Studies, Statistical Yearbook, 2015. 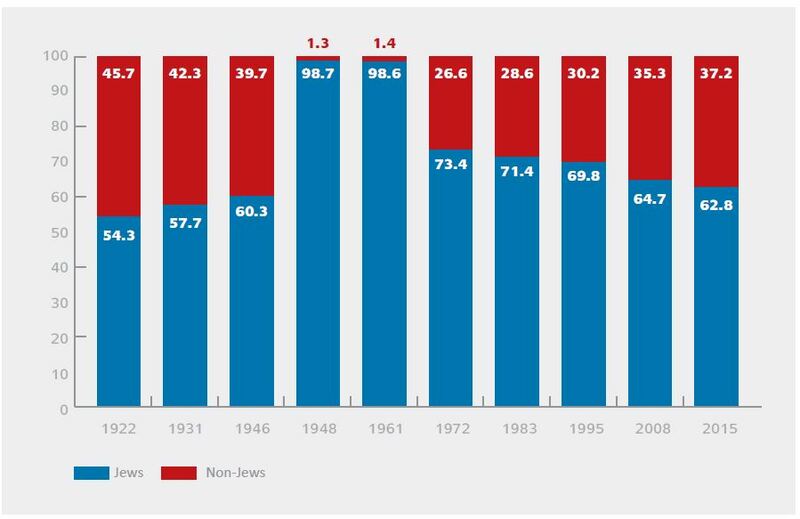 As the number of residents has shifted, so too has the balance between Jews and non-Jews (Figure 7.2). In the latter part of the British Mandate, Jews constituted 60 percent of the city’s population. After the city was divided, the western part remained primarily Jewish. The Jewish majority of Jerusalem (western, of course) was more substantial than in the rest of the country – 99 percent of Jerusalem versus 85 percent of the entire country. With the reunification of Jerusalem, the non-Jewish residents of the eastern sector were added, and all at once the proportion of Jews was reduced to three-quarters. Since then, the growth of the non-Jewish population has been more rapid than that of the Jewish population. At the beginning of 2015, Jerusalem’s Jews constituted 62.8 percent of the city’s population, a proportion lower than that of Jews in all of Israel. The balance between Jews and non-Jews differs in each part of the city. While in the western part, almost all the residents are Jewish, in the eastern part, Jews constitute 40 percent. However, in absolute terms, in the Jewish neighborhoods in the eastern part of the city and the old city, there are 200,000 Jews altogether. Analysis of the five-year period between 2009 and 2013 shows that the growth of Jerusalem’s Jewish population was due to natural growth, the settling of new immigrants, an internal migration balance with other cities and towns, and a balance between expat Israelis and those who returned (Table 7.1). Although the natural movement and settling of immigrants increased the number of Jews in the city, the internal balance of migration was negative, by approximately 37,000 people. (Some moved to secular Jewish cities near Jerusalem, such as Mevaseret Zion or to further away places, such as Tel Aviv. Others left Jerusalem for Haredi settlements or the ultra-Orthodox neighborhoods of Beit Shemesh, Modi’in Illit, and Beitar Illit, and some went to non-Haredi West Bank settlements.) The loss of residents from internal migration canceled out half the increase of the Jewish population from natural growth and Aliyah. The balance between new immigrants and the number of Jerusalem residents leaving Israel is also negative. Among non-Jews, natural growth and family unification account for a population rise, while internal migration brings it down slightly. All told, 31,000 were added to the Jewish population in the past five years, and 40,000 to the non-Jewish population, which means that Jerusalem’s Jewish population grew at a slower pace than its non-Jewish population. Table 7.1. Components of Jewish and Non-Jewish Population Growth in Jerusalem, 2009-2013. In each of the years between 2009 and 2013, non-Jewish population growth outstripped Jewish growth by a percentage point or two. Despite this, new data published on Jerusalem Day by the Jerusalem Institute for Israel Studies show that in 2014, the growth rate of the Jewish population increased considerably and was close to that of the non-Jewish population. In other words, as opposed to previous years when the non-Jewish population grew at a much higher rate than the Jewish one, in 2014 the two demographics grew at a more similar rate. Each of the three factors mentioned had an effect on this: a rise in the Jewish population’s natural growth rates (mostly among its Haredi population), a reduction in the Jewish population’s negative internal migration balance, and an increased number of new immigrants choosing to live in Jerusalem. However, the proportion of Jews in Jerusalem is on a consistently downward trajectory. At this time, it is difficult to determine if the new data showing a narrowing growth rate gap between Jews and non-Jews signals a long-term development that will stabilize the balance between the two groups at the current level, or whether it represents a temporary change only, and, in the coming years, the non-Jewish growth rate will once again be greater than the Jewish one. In the second instance, it is even possible that the Jewish population will cease to be a majority in the city, perhaps by mid-century.